The four members of pop group Abba have attended the Swedish premiere of Mamma Mia, the film which features 22 of their songs. Several thousand fans cheered as Benny Andersson, Bjorn Ulvaeus, Anni-Frid Lyngstad and Agnetha Faltskog walked down the red carpet in Stockholm. Lyngstad and Faltskog also embraced Meryl Streep, one of the movie's stars. The group had not met up since the original Mamma Mia musical opened in Sweden in February 2005, Lyngstad said. And they have not performed in public since 1986, 12 years after shooting to fame by winning the Eurovision Song Contest with their track Waterloo. 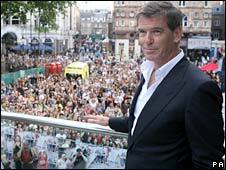 Earlier, former James Bond star Pierce Brosnan, who is heard singing hits including Waterloo in the film, said he "kind of rather enjoyed" wearing tight costumes for his role. "The Spandex was a bit of a challenge and the boots were [too]," he told reporters. "But I had the time of my life making this movie." Streep said the prospect of singing had excited her since performing in school musicals such as Oklahoma!. "That was my beginning so it was kind of like coming home to the thing that I loved very, very much," she said. But she declined to reveal the Abba song she liked best, saying it was "like saying which of your children is your favourite". She added: "I don't think of it in sports terms like that." 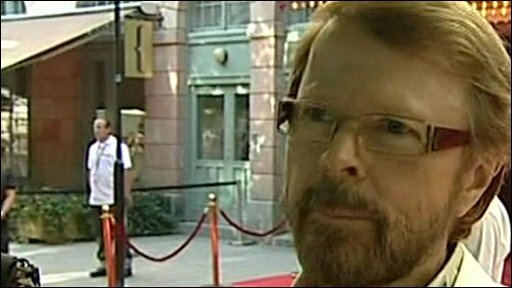 Ulvaeus praised the actors' vocal talents in the film, which has been adapted from the hit stage musical. "Most of them don't think they can sing, but they can, I assure you," he said.